The Massandra Palace in Crimea. The elegant palace in the French style belonged to the last two Russian emperors and after the revolution was Joseph Stalin's dacha - we explore its history and unearth some interesting facts. Massandra is one of the most beautiful places on Crimea's southern coast, with its picturesque rocks, grottos, natural springs, and waterfall. After the Crimean Khanate became part of the Russian Empire in 1783, Empress Catherine II granted the Massandra estate to the French aristocrat, rear admiral, and fortune-seeker of European-wide renown, Karl Heinrich von Nassau-Siegen, but neither he nor the building's numerous subsequent owners lived in the palace. In the second half of the 19th century Massandra ended up among the properties of Crimean Governor-General Count Vorontsov, who had a luxury palace in the English style built nearby in Alupka. 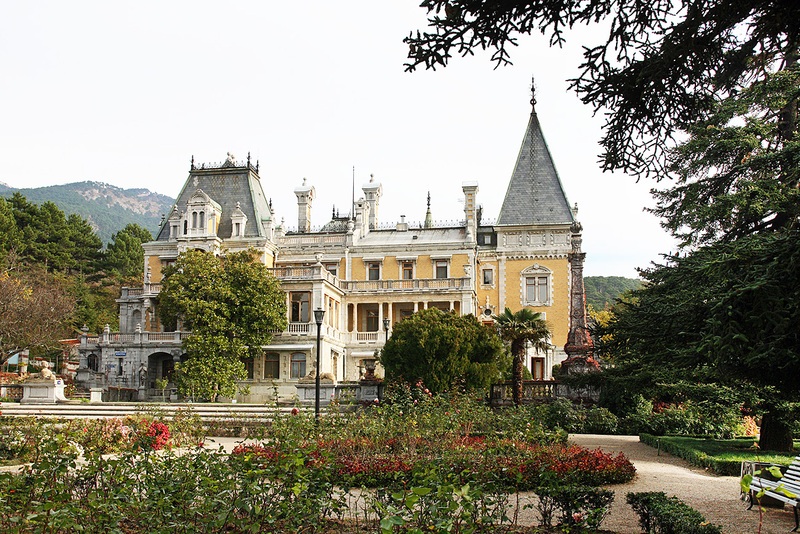 In 1879 his son, Prince Semyon Vorontsov, began the construction of the palace in Massandra. But two years later the architect died, followed by the death of Vorontsov himself, and the estate was once again abandoned. In 1889 the unfinished palace was bought by the Treasury for 85,000 rubles for Emperor Alexander III. But he also died before seeing the finished project. In his father's memory, Nicholas II completed the construction of the palace. The Romanovs never lived or even spent a night in the palace - the imperial residence in Crimea was in Livadia and the Massandra Palace was used for short stops during hunting trips or visits to the Church of the Beheading of John the Baptist (built near a natural mountain spring at the beginning of the 19th century, which was demolished after the revolution). Three palaces around Yalta are an example of how the great architecture of the past was reinterpreted in the 19th century - an English castle was built in Alupka, an Italian villa in Livadia, and a French palace in Massandra. The first architect, who worked in Massandra when Vorontsov was alive, was the Frenchman Étienne Bouchard, who conceived the palace in the style of the medieval French castles of the Loire Valley - with round towers and high roofing. Under the Romanovs, Maximilian Messmacher, the famous architect who designed a number of mansions in St. Petersburg, completed the construction work. Messmacher retained his predecessor's building but significantly refined the details, giving the palace a lighter look and more decorative features by adding elements of the Renaissance and Baroque in the style of Louis XIII. Open balconies and terraces, tracery balustrades, and a beautiful semicircular staircase were added to the previously austere palace, built of local gray limestone, and the walls were lined with decorative light yellow Metlakh tiles that turned the building into an animated illustration of the tales of Charles Perrault. The formal park laid out in front of the palace continued the French theme - flowerbeds with fountains descended a stepped slope, opening up a view of the surrounding landscape. They were decorated with sculptures, partly made of artificial stone and partly plaster casts of antique statues from the Imperial Museum of Fine Arts in Berlin. Since the Romanovs did not plan to live in the palace, it was not surrounded by the usual collection of auxiliary buildings, except for a guardhouse. But anyone could come and view the architecture and park. The palace was modest in character and designed for brief stays in comfortable surroundings. It lacks the usual grand suites, and the imperial bedchamber is decked out with a sofa and armchairs instead of a bed. The rooms are decorated in different historical styles, as was the fashion in the second half of the 19th century: A Renaissance-inspired dining room with wooden paneling and bulky carved sideboards, a Rococo boudoir, and the emperor and empress's private rooms in the Neoclassical style with "Russian Jacob" furniture. In the wake of the Russian Revolution the palace was used as a sanatorium for a while. In 1948 it was turned into a well guarded dacha. Joseph Stalin came here twice on holiday. It was also frequented by general secretaries Nikita Khrushchev and Leonid Brezhnev. A museum was finally opened here in 1992. Read more: What is happening to mansions that were abandoned in 1917?